In our November issue, Nishikant Sonwalkar opened a discussion of pedagogical learning styles with a feature article, “Changing the Interface of Education with Revolutionary Learning Technologies.” Here, he follows the thread further, focusing on pedagogically driven design principles for online education. Pedagogy can be defined as the method by which educational content is exposed to learners. There are more than 300 different pedagogical strategies that have been proposed to define the underlying cognitive process. Activist, constructivist, reflective, incidental, apprenticeship, inductive, deductive, collaborative—these are just a few pedagogical theories that are widely debated. In the November issue of Syllabus, I proposed a “learning cube” that combines six different media—text, graphics, audio, video, animation, and simulation with five functional learning styles—apprenticeship, incidental, inductive, deductive, and discovery. 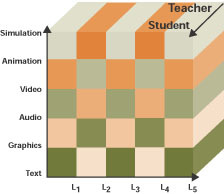 The learning cube (see Figure 1) is an attempt to provide a framework in which multimedia assets can be correlated with pedagogically driven learning styles. Let’s take just one example of what the learning cube can reveal about the potential of online pedagogy. The apprenticeship style of learning suggests that educational content should unfold in a step-by-step procedural model; however, the same content could be exposed in the form of a case study or story in the incidental learning strategy. The intent of the learning cube-based pedagogical model is to organize and sequence the multimedia content assets in a pedagogically distinctive learning path that matches the style of individual learners. Ideally, all learner preferences can be accommodated. It is important to understand that pedagogy influences the methodology for content sequencing and chunking, while instructional design enables an organized structure for the dissemination of online courses. Based on the learning cube, one can generate a simpler 2D model (see Figure 2) of a flexible cognitive approach to pedagogical strategies for online education. The model correlates learning assets (media) with pedagogical learning styles. 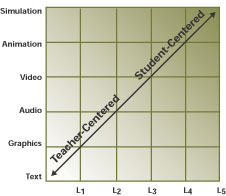 The learning path scales from student-centered to teacher-centered relative to involvement with media and the degree of independence offered by the learning strategy. Presumably, the learning path could deviate based on perceived learner needs in any given instance. Instructional design is a process that enables conversion of raw content into a structured distribution—e.g., into a lesson structure. Conventionally, instructors have prepared lecture notes from reference books and textbooks on a given subject. This is a process of converting domain knowledge into structured lectures or lesson plans. The instructional design for a Web course is still an art form. This is primarily because of the variations in the nature of course content. The learning models that are appropriate for course material are numerous, and a wide range of possibilities exist for the course’s structure. Instructional design in the conventional sense addresses the need for structuring course content to meet the curriculum. However, in the context of online education, instructional design leads to information design and chunking. For asynchronous learning, it is extremely important to note that distributing course content in the form of online textbooks (e.g., in PDF or HTML formats) is not sufficient. Adding to this distribution format just causes information overload on the course Web site, which can be detrimental to learning goals. And a well-endowed course Web site cannot by itself deliver successful online education. Three issues are central to the development of pedagogically driven instructional design for online education: learning style-based instructional design, design parameters, and the design and development procedure. In my previous article, brief definitions of the learning styles for the learning cube were provided. Here, I’ve augmented those definitions with listings of recommended content and media objects, in order to illustrate the multiple media available to any given learner and to show how the learning styles—apprenticeship, incidental, inductive, deductive, and discovery—can influence the instructional design of an online course. Apprenticeship. The apprenticeship style uses a “building block” approach for presenting concepts in a step-by-step procedural learning style. This approach is particularly appropriate for the task-oriented areas where one can identify clear step-by-step procedures. Incidental. The incidental style is based on “events” that trigger the learning experience. The events usually occur in a less formal context and often assume a story format. Learners begin with an event that introduces the concept and provokes questions about it. Learners are then prompted to knowledge presented in the steps that may lead to procedures about the target concept. Explanations are then provided. Inductive. The inductive style suggests that learners first be introduced to a concept or a target principle using specific examples that pertain to a broader topic area. The examples enable learners to develop their own connection between the concept and the examples that confirm the principle. The examples lead to conclusions or questions about the material, which may then be confirmed, refined, or answered with subsequent explanations. Deductive. The deductive style is based on stimulating the discernment of trends through the presentation of data, simulations, graphs, charts, or other data. Based on the data provided, learners are instructed to infer concepts and postulates. Additional explanations are then provided if necessary. The examples or data presented lead to the concept that is part of the learning objectives. Discovery. The discovery style is based on an inquiry method of learning in which the learner understands concepts in a “learn by doing” methodology. Learners test the boundaries of their own knowledge and ability by first engaging in an interactive exercise, simulation, or quiz. The design parameters are numerous and need careful consideration. A few important decision parameters include learning objectives, pedagogical learning styles, synchronous vs. asynchronous, textbook vs. experiment-based, media assets and enhancements, duration of delivery, technological constraints, and educational standards. Learning objectives. Learning objectives are often loosely defined and, as such, do not provide much help in the development of the instructional design. For example, if the learning objective is “to teach a course in introductory fluid mechanics,” it d'es not help define what the scope and extent of the course content will be. It is important, therefore, to describe the course objectives in the form of a finite set of fundamental concepts that will be taught in the online course. A pedagogically driven instructional design requires that the course objectives be defined in terms of concepts. Pedagogical learning styles. The pedagogical learning styles—apprenticeship, incidental, inductive, deductive, and discovery—define the pedagogical strategy for the exposition of the course content. The intent of the lesson strategy and the relevant media assets are chosen based on the examples given in the previous section. Synchronous vs. asynchronous. The instructional design will change dramatically based on whether the instructor is available to students by synchronous communication online or by asynchronous e-mail. The predominant mode for online courses will be asynchronous, so appropriate devices such as chat rooms, discussion boards, and news groups need to be included in the instructional design. Textbook vs. virtual experiment-based. The content development to support online education will change if the source is a textbook. The textbook, in the conventional sense, is sequenced in terms of chapters, sections, and subsections. In the case of online courses, content is defined in terms of course structure hierarchy. Besides viewing course content creation in terms of the hypermedia textbook, it is important to define the interaction between instructor and student. 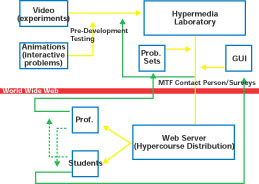 And the educational environment needs to be designed around content objects that are presented in the multiple learning styles developed in the hypermedia (Web) environment (see Figure 3). The online virtual experimental course requires a much different design method. In Web-based experimental courses, termed Web labs (see Figure 4), the content is developed as a set of simulations that support discovery-based learning. Such environments could include animation, 3D visual simulations, or virtual reality-based immersion learning. Such simulations are called hypermedia laboratories, and they connect to the interactive asynchronous interface between instructors and learners. Media assets and enhancements. Media assets—text, graphics, audio, video, animation, and simulation—constitute the content collection for an online course. The instructional design can take advantage of the learner’s cognitive preferences if the content is available in each of the various media formats. Duration of delivery. Perhaps it’s obvious that a semester-long course will require much more content for instructional design, compared to a two-week-long “short course.” Stand-and-deliver lectures, when converted to online, computer-based instruction, actually require more content to ensure that the concepts are presented in an interactive, multimedia fashion. In a purely asynchronous online environment, the duration can vary, so it is essential to provide instructor feedback for the duration of the course. Technological constraints. Technological constraints are important design variables—especially in relation to the success of interactive Web pages that can be accessed via the Internet. The network bandwidth limitations on accessing an online course using a 56 kilobits/sec modem are severe when compared to accessing a course in the workplace using a T1 line that provides close to a 1 megabit/sec connection speed. Web browsers pose technical limitations on the media objects that can be distributed via the Web. Similarly, Internet servers, video servers, and chat servers demand careful consideration in instructional designs. Educational standards. The evolving standards, such as Instructional Management System (IMS), Aviation Industry Courseware Committee (AICC) standards, and Sharable Courseware Objects Reference Model (SCORM), provide guidelines for course structure object hierarchy, course structure objects, learning assets, and assessment models. It is important to note that the procedure involved in the creation, design, and development of online education requires participation from the domain expert—to envision the course structure, formulate a strategy for pedagogical presentation with multiple learning styles, and specify the content sources (see Figure 5). It is essential that the content experts work closely with the instructional designer to develop the appropriate pedagogical strategy, and work with Web developers and graphic designers to create an effective graphical user interface. Next, content is collected from the appropriate sources, with copyright permissions, and converted into formats compatible for delivery via Web pages. Once the content is converted into Web-compatible formats, it is chunked to meet the instructional design requirements to create learning assets and objects. These learning assets are described with metadata standards and loaded into databases that are compatible with IMS, AICC, or SCORM standards. At this point in development, content is prepared for deployment via the Web, and the Web course pages are made available to content experts for final editing. Once the final edits are made, all the hypermedia learning assets are assembled and compiled to follow the learning styles for online courses. It is essential to conduct user interface testing with a focus group in order to fix any problems that may arise regarding page layout or navigation. Education is a process that requires the design and development of media content in the context of pedagogical learning styles. It is crucial that the design of the next generation of online courses take into consideration a large degree of flexibility in learning styles and support interaction between instructor and learners in the asynchronous environment.